Tablets represent a unique, efficient and engaging way to deliver training. They’re somewhat of a middle-ground between e-Learning that has to be done on a desktop or laptop computer, and modules available on a mobile phone. Using an iPad or another type of tablet is advantageous because it offers a larger screen than training on a smartphone, yet it’s obviously mobile and can be on-the-go with employees. While it’s beneficial to almost any industry, some of the industries that are embracing employee tablet training most quickly and widely include retail, restaurants and hospitality, and those reliant on sales professionals who are often never in one location for long but still need to receive training and educational materials. Tablet and mobile-based training are generally great for customer-centric positions in which the employee is expected to provide information quickly or even immediately. It can also raise the quality of training for field workers. Another advantage of tablet training? It’s ideally suited to gamification, which is one of the biggest trends in e-Learning and corporate training at the moment. Tablets are inherently designed to support gamification, and it creates a natural fit between the games you’re including as part of training and your employees’ level of comfort and familiarity with such a concept. When introduced on a tablet, training games can become part of an employee’s’ regular routine pretty quickly, which can help training be more effective and can also improve retention and engagement. 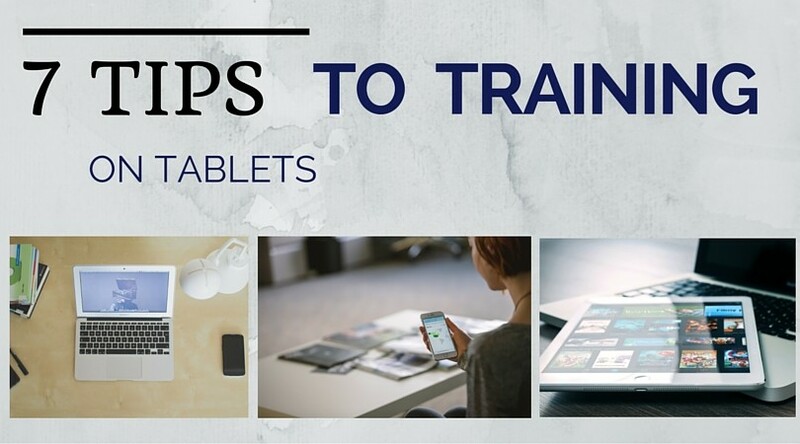 For employers who are willing to embrace the concept of employees training on tablets, we put together some of our top tips and tidbits to help you along the way. A Bring Your Own Device or BYOD policy is something many companies are weighing as mobile devices are becoming an increasingly critical part of everyday business. When you have a BYOD policy in place, employees are permitted to have their own smartphone or tablet, from which they can access business information including e-Learning and training. There are some things to consider and contemplate here. A BYOD policy can seem like a great idea because you save money on the cost of buying employees devices, but there can be data security concerns that arise as well. You’ll also have to think about what happens to business data and information when an employee leaves the company. If you’re considering tablet-based training, you’ll need to select a learning management system that will support this concept. Your LMS should make it easy for you to create responsive courses that can seamlessly transition between traditional computers as well as mobile devices. Responsive design isn’t as simple as just changing sizes, but is rather about having an LMS that will automatically tailor every aspect of your course design to the device it’s being viewed on. While tablets prove to be an excellent delivery method for e-Learning, this type of training might not be right for every employee or organization. Before you launch tablet-driven training, assess your workforce to see how familiar and comfortable they are with the interface of a tablet. If you have a less tech-savvy workforce, there may be a significant learning curve for the tablet itself, which can lengthen overall training time. One of the biggest advantages of tablet training is that employees aren’t burdened by having to remember every detail from a traditional classroom situation. They have access to the crucial information they need at their fingertips, so make it easy for them to access this information. Keep e-Learning modules well-organized and easy to sift through to find the particular information an employee may be looking for at any given moment. Include guides like tables of contents and ensure navigation is simple and intuitive for the best results. Consider for a moment this situation: Your goal is to train an employee on how to use a point-of-sale software platform they’ll use on a daily basis in their position. You could train them at a particular time in a classroom or from a computer, but wouldn’t it be more effective to teach them to use the POS when they’re actually faced with doing certain tasks? It doesn’t just have to be training on a point-of-sale system—you could make this work for almost any situation your employees face on a regular basis. Create realistic training videos that highlight tasks employees are expected to do regularly, and then they can access the videos while they’re on the job. You’ll be amazed at how much more effective training will become as a result. While using tablets to administer training has tremendous upsides, there are considerations to keep in mind, and possibly one of the most important of those is data security. As part of your overall training program, make sure you also integrate data security training. Tablets pose different security risks as compared to classroom training for example, so this needs to be part of your strategy and plan for implementing tablets. There are some general technical and design tips to keep in mind when creating courses for tablets. One is that you may want to choose HTML5 instead of flash because many mobile devices don’t have support for flash. Another seemingly simple but important tip is to remember to make navigation buttons optimized for use on a tablet. Remember, this is not the same as a computer screen, and small buttons and outside links can be hard to see and hard to click. Make sure navigation buttons are clearly visible and also large enough to make it easy to click them. Finally, pay attention to the size of the images you select when you’re designing your e-Learning. Images that are too large can dominate the screen on a tablet and detract from learning objectives. Tablets are an outstanding training delivery tool for your e-Learning. Consider employing the tips above and giving tablet training a try to breathe new life into how you educate and engage your employees.